Before I embarked on my trip to Dublin during St. Patrick’s Day, someone told me that I was wasting my time because the Irish don’t actually celebrate St. Patrick’s Day. That’s news to the Irish. 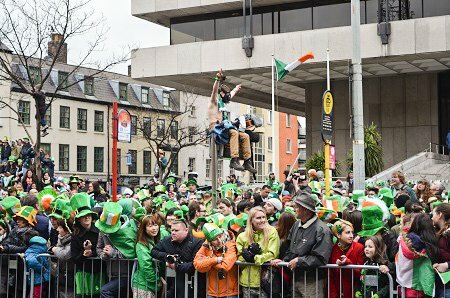 During my 4-day stay in Dublin, I saw more celebration than I have for any other holiday anywhere in the world. But what do I know? Maybe they weren’t celebrating St. Patrick’s Day at all; maybe the Irish are always drinking, singing, and dancing. Street performers outside the Guinness Brewery. During the festival, the entire city comes alive, all the buildings are bathed in green light in celebration. People are out in the streets en masse looking for a place to grab a pint and listen to some music. 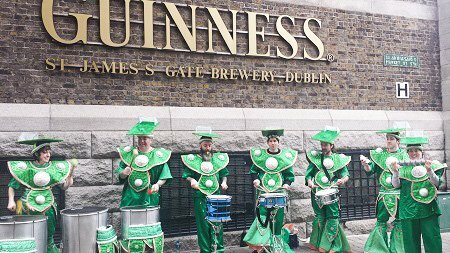 Whether you’re sightseeing or hanging out at a pub in Temple Bar, there will be no shortage of revelers around you. The Guinness brewery tour, which I’ve heard from other people is kind of a bore, has entertainment on each floor during the St. Patrick’s Day festivities, from live music to food tastings to jig dancing. Even outside St. James Gate Brewery, you can find street performers entertaining the crowds. 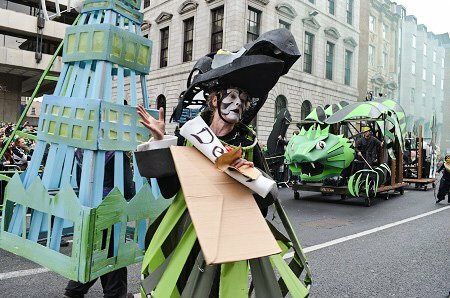 The St. Patrick’s Day parade is like a walking theater show. One of the highlights, for young and old alike, is the parade. I have to admit, I hate parades. I think they’re usually boring and full of makeshift floats from sponsor companies. The whole thing just ends up feeling like a bad walking advertisement, with a few marching bands thrown in for good measure. 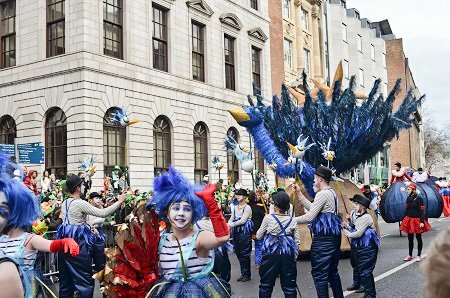 However, the St. Patrick’s parade in Dublin is a work of art. 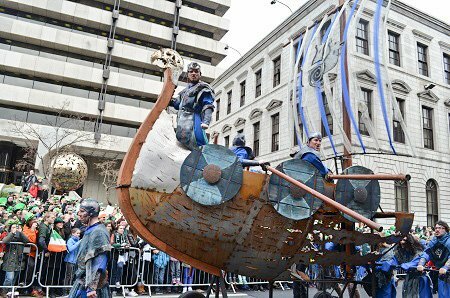 It’s like the parade equivalent of a Cirque du Soleil show. The costumes are intricate and the floats are elaborate sets for their musicians and dancers. It was actually a very fun parade to watch. The crowds on the parade route get pretty heavy and you may see a little mayhem. On our side of the route, a shirtless Irishman with a gas mask on climbed one of the street poles and sat up there playing guitar. The authorities waved him down but then they realized he was harmless so he was allowed to stay and play. The whole scene was very fun to watch. A happy Irishman watching the parade from a light pole. Once the parade has ended, people head out in droves to the bars. Every single bar will have live music. 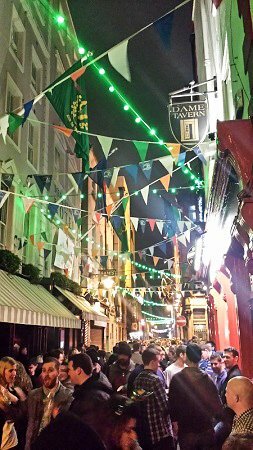 Even outside of the Temple Bar area, you can find partying and merriment. One of my favorite experiences in Dublin was at The Celt, a pub that we ran into to escape the rain. It has a large bar area in the front, but if you keep going toward the back, you’ll find another room past a small courtyard. There’s another bar there and on this particular day, there was a 4-piece band playing Irish jigs. The people enjoying the music ranged from young kids to their grandparents and they were all singing along, jig-dancing and drinking (yes, even the 10 year olds). It’s one of the best things I’ve ever accidentally walked into. 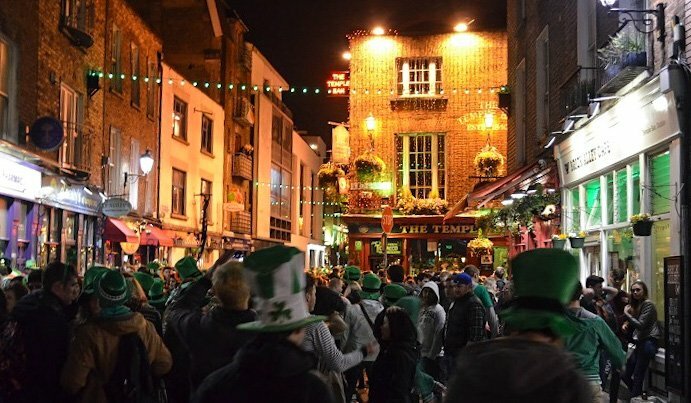 If you’re hitting Temple Bar on St. Patrick’s Day, your best bet is to get there in the afternoon so you have a chance at grabbing a table. The later it gets, the harder it will be to get a spot to relax. By the time it gets dark, the streets in Temple Bar have turned into a giant block party. People are just wandering in and out of bars, and if you don’t already have a good buzz on, it’ll be harder to get a drink later in the night. That’s not to say you won’t get one; the Irish certainly keep the booze flowing until the wee hours any day of the week but especially on St. Patty’s. After a few hours and a few beers, you’ll know at least one traditional Irish song by heart.